Thank you for using a PENTAX *istD digital camera. 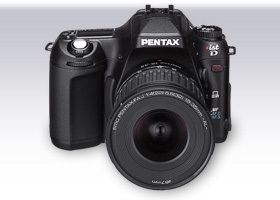 PENTAX wishes to announce the release of Firmware Update Software Version 1.12 for *istD. Correspond to the media card that exceeded 4GB, also Version 1.12 contain the additional function which was released at Version 1.10 ~ 1.11. Only *istD users are permitted to download the firmware update. Corresponded to the newly released software PENTAX REMOTE Assistant which is arrow you to control the *istD digital SLR camera from your PC in various ways.For download the PENTAX REMOTE Assistant for Windows and Macintosh, click here. You can use the HyM (hyper manual) function when your lens aperture ring is set to a position other than the "A" position. You can use EV compensation in the M (manual) mode. If you are using the auto bracketing mode and the camera automatically powers down after a period of inactivity, the auto bracketing mode will not be cancelled. Note that turning off your camera normally will cancel the auto bracketing mode. This enhancement only applies when the *istD engages its auto-power-off function. The file format and file system of the *istD are compatible with the EXIF 2.21 and the DCF 2.0 standards. When you set [Color Space] in the *istD custom function menu to [Adobe RGB], your TIFF and JPEG image file names will change from "IMGPxxxx" to "_IGPxxxx" where "xxxx" is a 4 digit numeral. For more information on these enhancements and how to use them, click here (PDF document, 25.2kb). Check your current firmware version, to verify that your camera can be updated. To do this, hold down your camera's MENU button while turning the camera on. Your camera's LCD screen will display the current version of the firmware. Make sure the current version is prior to this update of 1.12. For example, "VER: 1.00, 1.10 and 1.11 can be updated to version 1.12. Prepare a CF memory card with maximum memory capacity of 4GB for use in updating. This Compact Flash card should be freshly formatted by your camera or otherwise be empty of all files. Have your AC adapter (K-AC10) ready for use during the update, or make sure your batteries are fresh and have a full charge. If the power of the camera goes off due to a battery power shortage or any other reason during updating, the camera may become in-operatable unless repaired. If a repair is required as a result of a power shortage or mishandling during firmware updating, repair fees will be charged even if the camera is still under warranty. Fwdc112b.bin: This is the Updated firmware. Please read the readme txt file attached to the firmware update before updating the firmware. Optio is a trademark of RICOH IMAGING COMPANY, LTD.